Today's post is filled with photos that I haven't shared in any earlier posts. Nothing ties them together thematically; they are just a random assortment of images from my life! 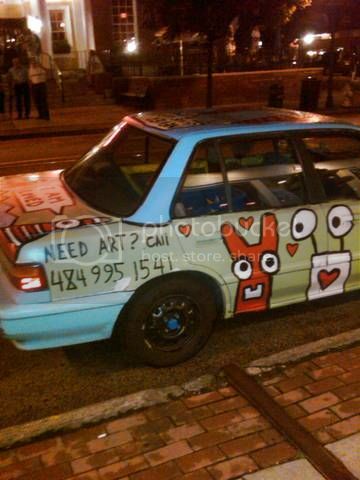 I spotted this awesome art car on State Street in Media, Pennsylvania, one evening. Its owner was selling his folk-art style artwork on the sidewalk nearby. I haven't tried calling the phone number on his car; if you call him, let me know what you talk about! 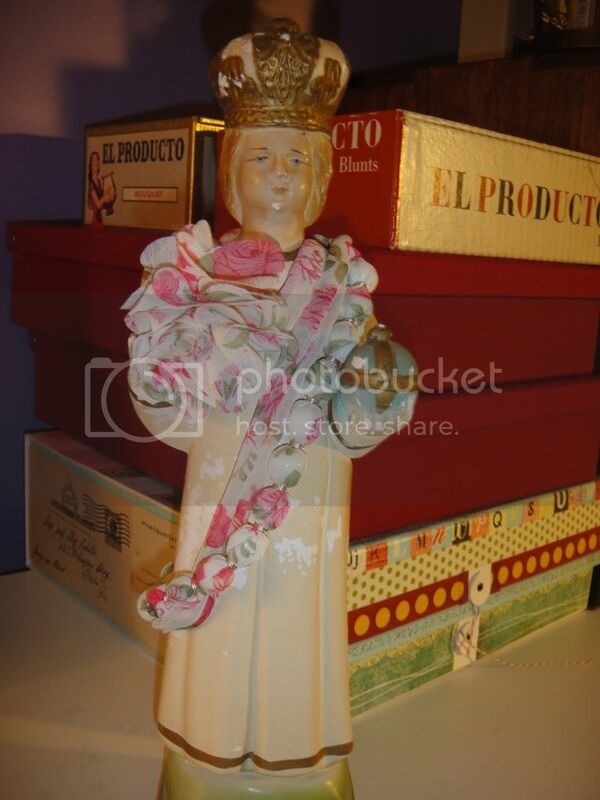 I purchased this saint at a local flea market for 50 cents, and have informally declared him the Patron Saint of Studio 791. He is draped in a floral necklace I found at Old Navy a few months back. He holds pride of place next to my boxes of washi tape and postage stamps on top of my bookcase full of art and crafting books. Have you seen my cat, Stella? 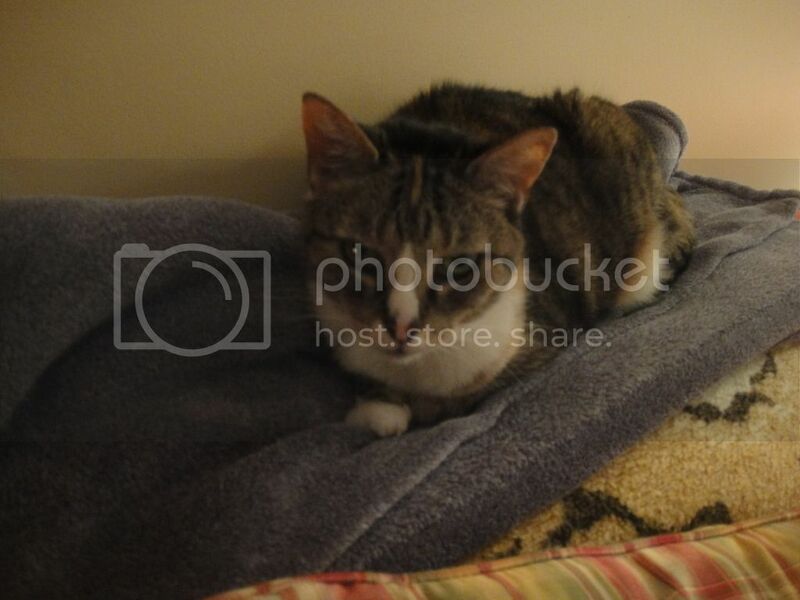 I don't think I've shared too many photos of her, even though she has been in my life for fifteen years now. Fifteen years!! She has two or three favorite spots in the house, and pretty much doesn't budge from them. 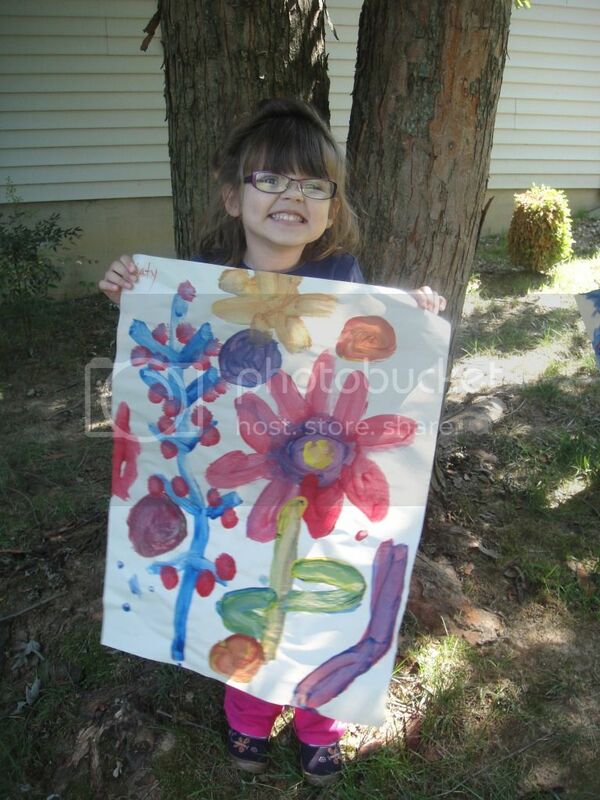 My four-year-old Katy displays her first painting from preschool this year. 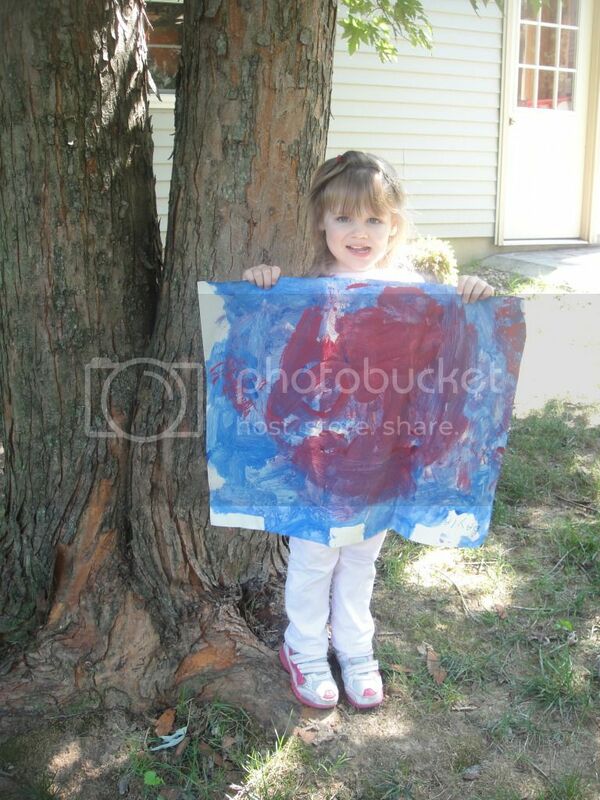 My three-year-old Bayla displays her first painting from preschool this year. 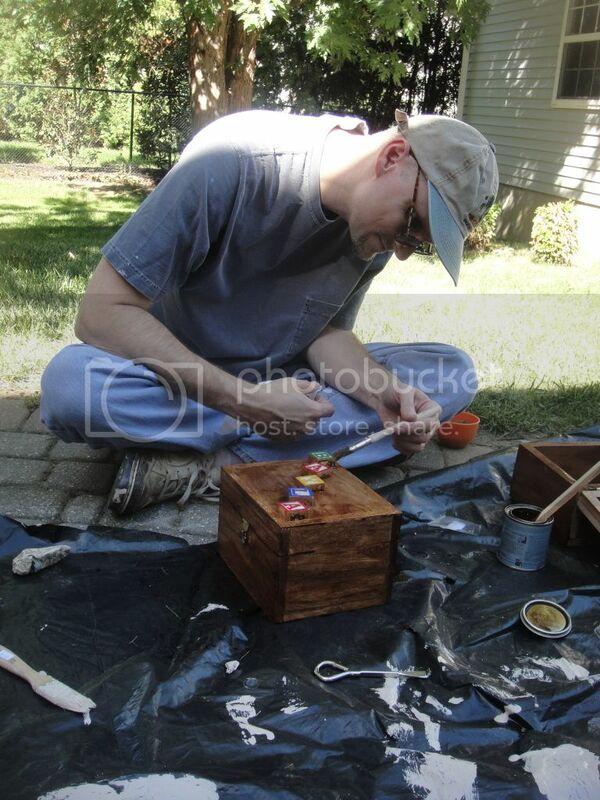 My husband gets in on all of the creative action around here, staining a wooden jewelry box he is making for Katy. He has another for Bayla, and has used wooden letter blocks to spell their names on the lids. He is trying to develop his woodworking skills with these projects. Finally, here I am cooking dinner while simultaneously reorganizing the cabinet that holds my spices. 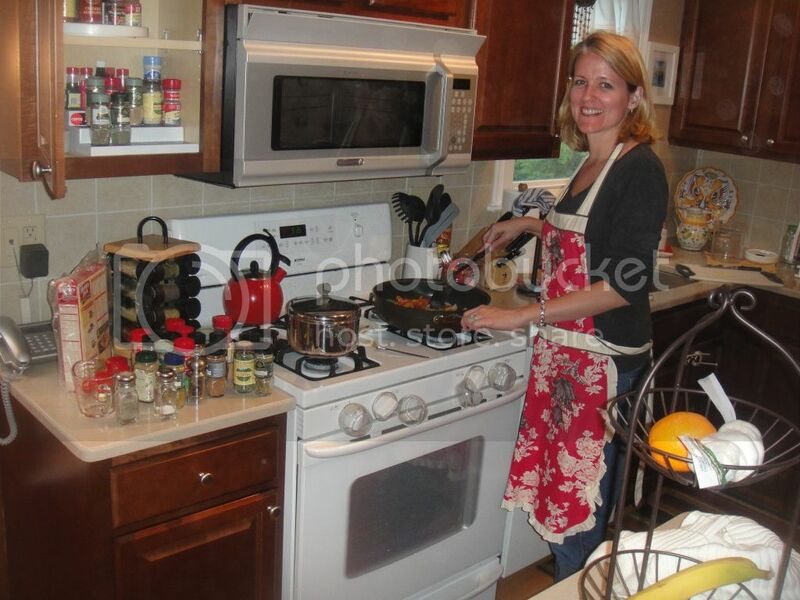 When my husband came in and saw all those spice bottles on the counter, he thought it was pretty funny that I looked like I was throwing them all in the evening's recipe, so he grabbed the camera and took this pic. Take some fun photos of your everyday life this weekend! On any given day, I have a pretty good idea that the water or gas company is going to send me a bill, and that Pottery Barn or Sundance is going to send me a catalog, and that Karenann or Pamela is going to send me an artful postcard. 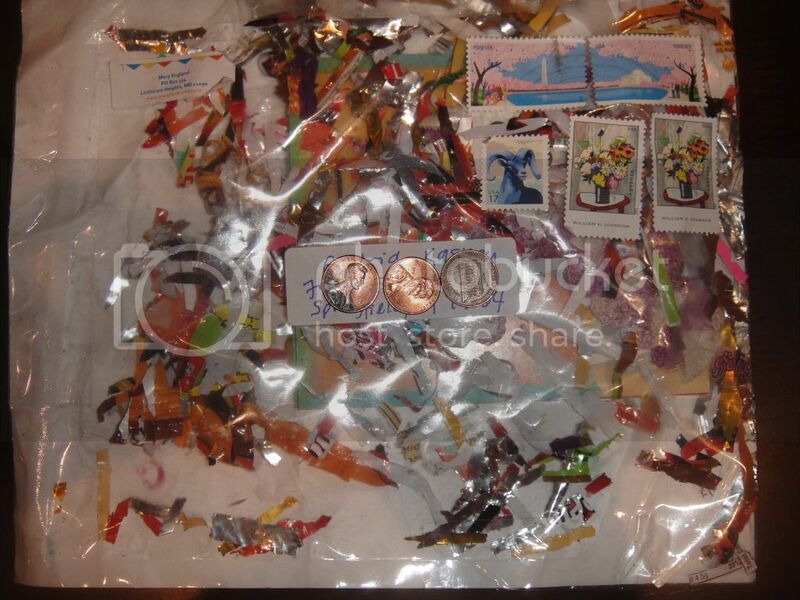 But I have to say that when Mary England sends me something in the mail, I never know exactly WHAT to expect! 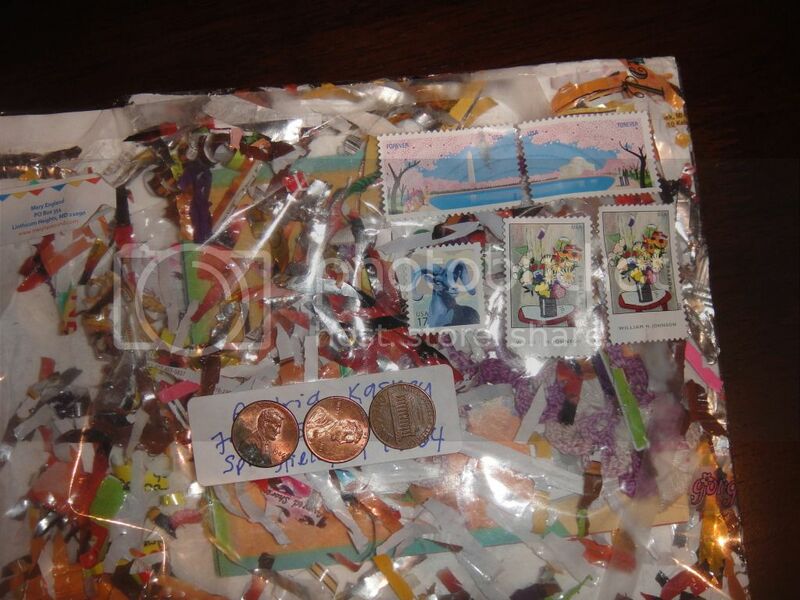 Have you ever had the pleasure of receiving a completely see-through envelope filled with shiny confetti? But Mary sent me just such a fun piece of mail art a few months ago, containing calendar pages and a crocheted cross, which I thought was a sweet acknowledgement of my faith. 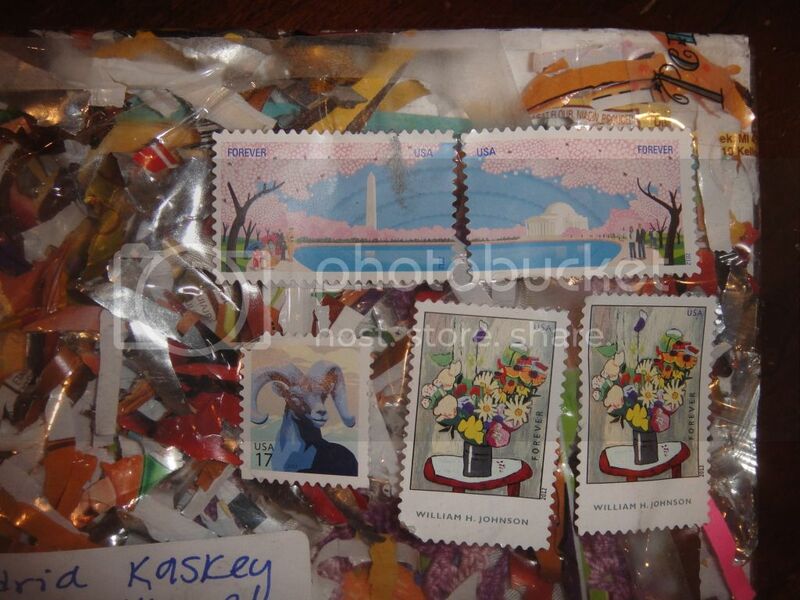 And postage stamps look positively delicious against a transparent background! 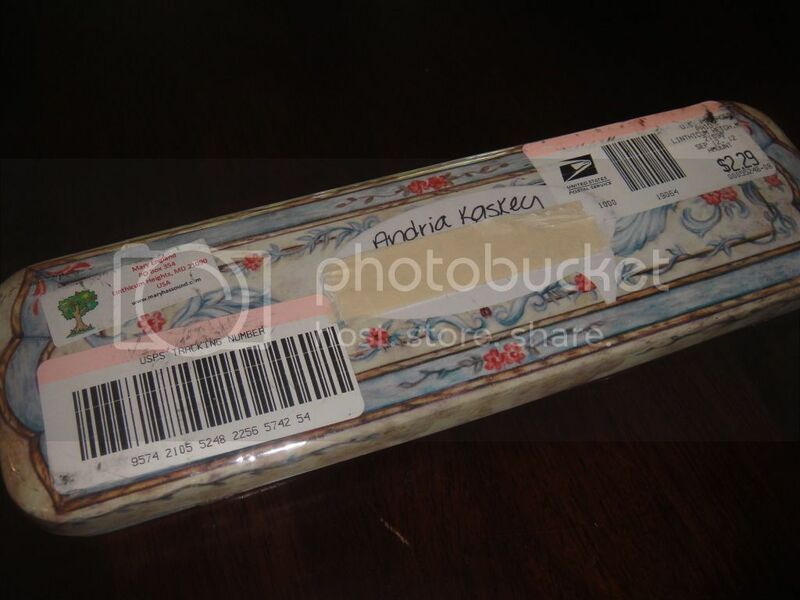 Then, more recently, I opened my mailbox to discover a tin marked with my address and postage. A tin!! I've never gotten wacky objects in the mail before now, and I LOVE it! 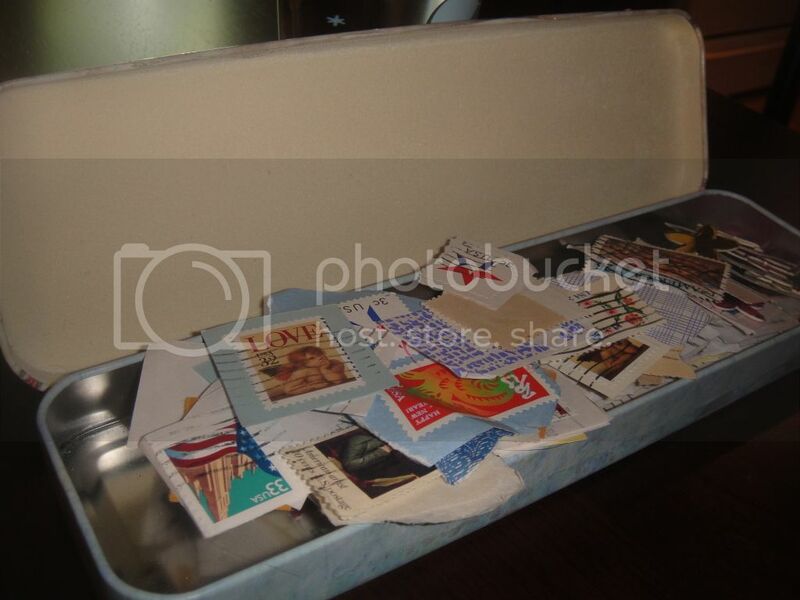 Even better, when I opened it up, she had sent me a whole slew of postage stamps to add to my collection for my mail art. 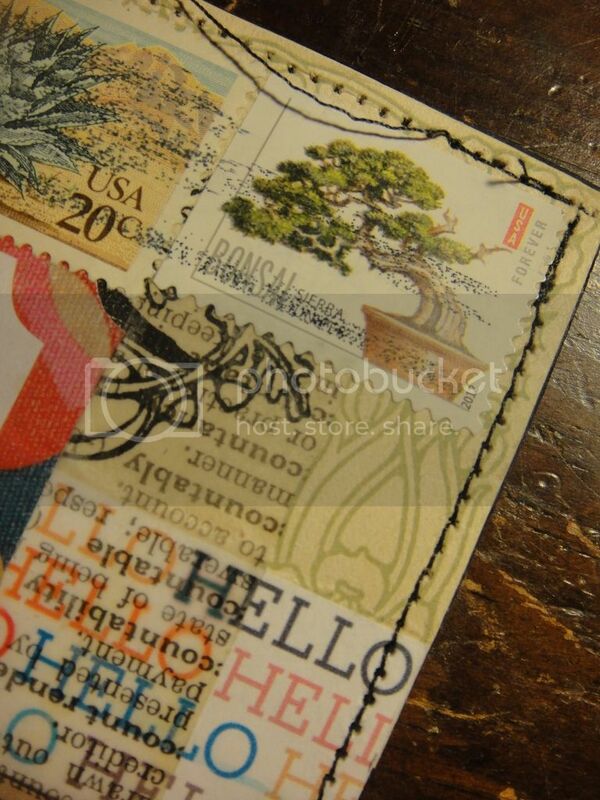 Now, what can be better than interesting mail from a girl who pays attention to what is important to you?! Many thanks to Mary for her merry Mary mail. 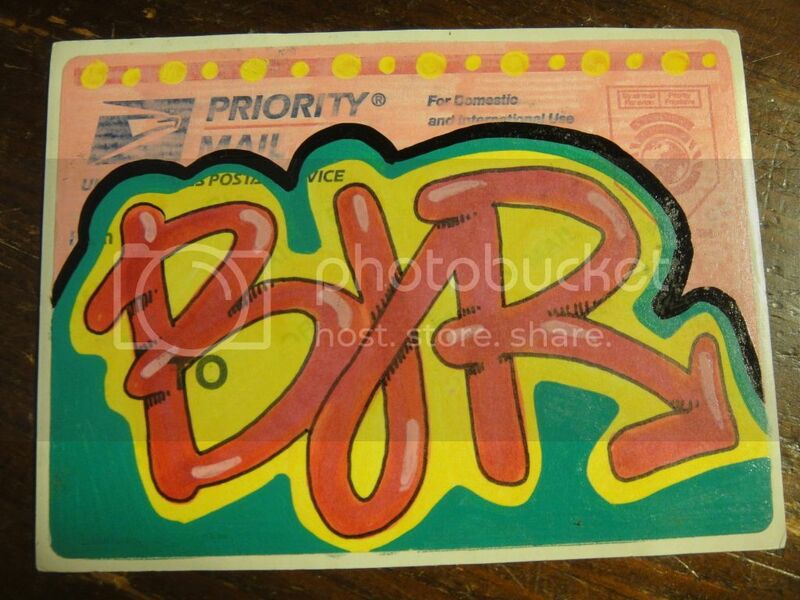 What can you send out in the mail today to brighten someone's day? I have to share a story that positively warmed my heart today. My girls were sitting at the breakfast table this afternoon, drawing away on their sketch paper, creating stories around the pictures they were creating. I loved seeing all that creativity flowing, so I said, "It's like an artist's workshop in here! How did you two get so artistic? Were you born that way?" 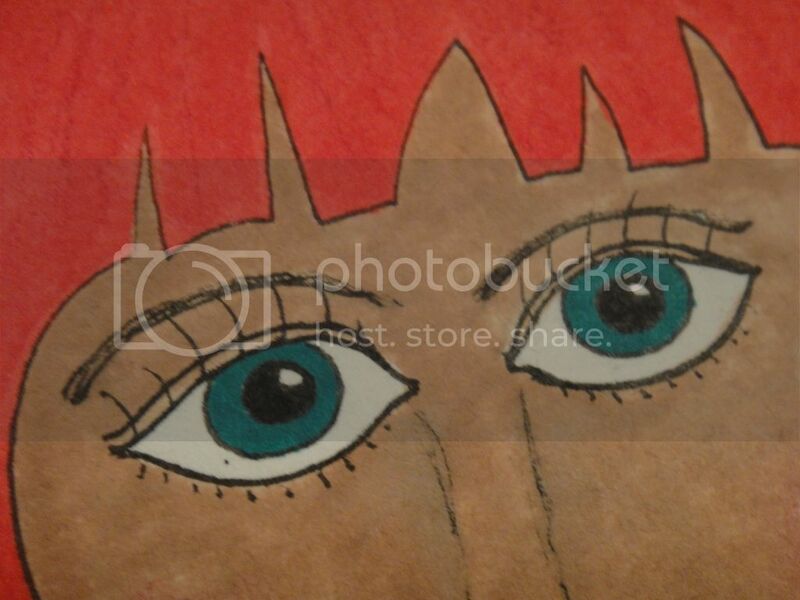 My four-year-old, Katy, said, "When I was little, I saw you art-ing, and that made me realize that I want to art, too." There are all kinds of ups and downs to this motherhood thing, but that statement alone should carry me through for quite some time!! I am having a lucky streak right now, winning some very fun giveaways from my blogging friends. 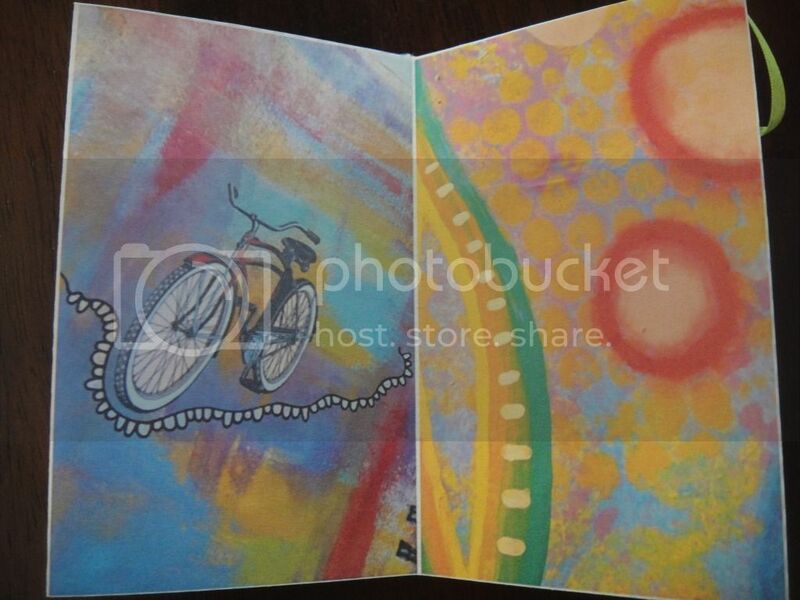 From Tammy, at Daisy Yellow, I won a set of her new Art Journal prompt cards! 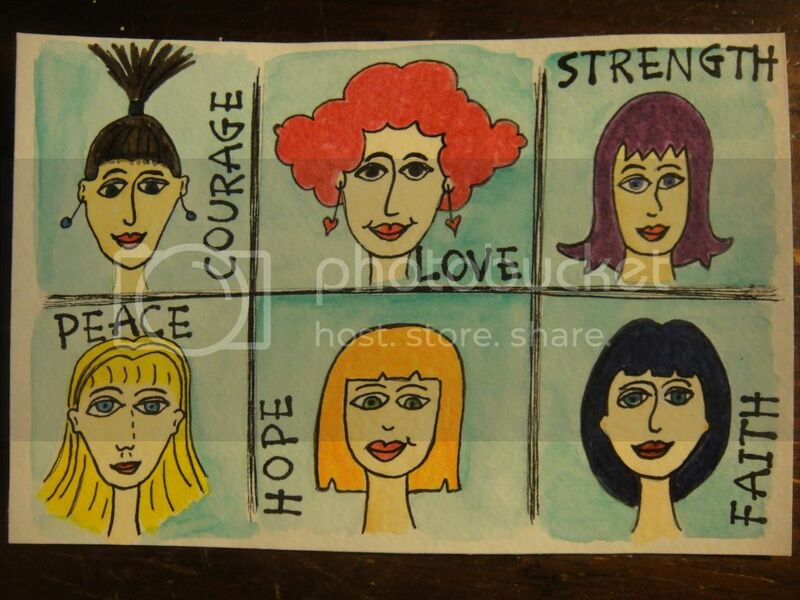 Each one is about the size of a business card, and re-creates a BINGO card of art journaling prompts that can be combined in a multitude of ways. 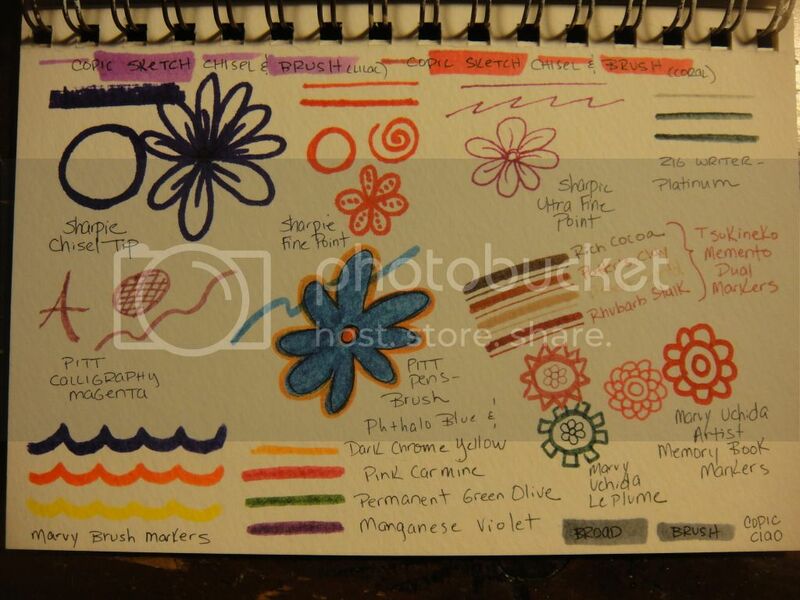 To "play," you just select a word or prompt from each column, and then combine them to create a uniquely inspired art journal page. 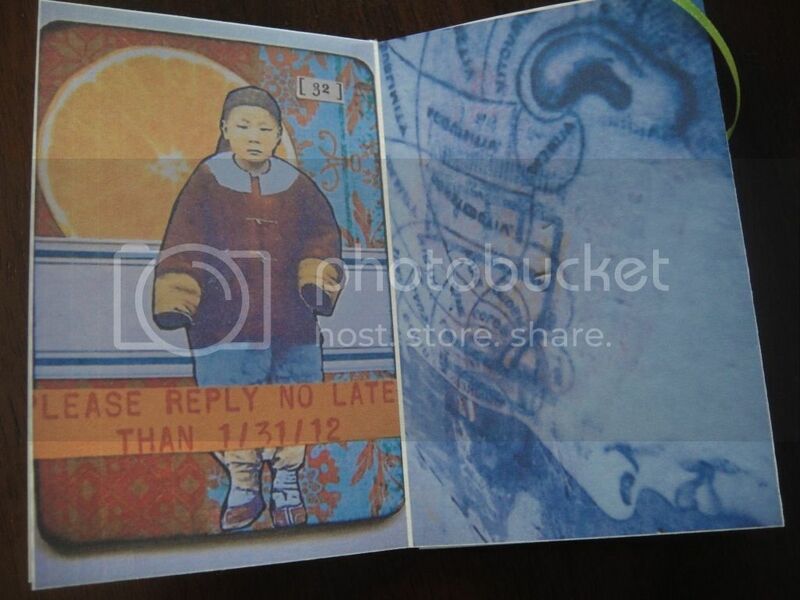 For example, on the first card pictured here, I might choose B2 I5 N4 G2 O4. 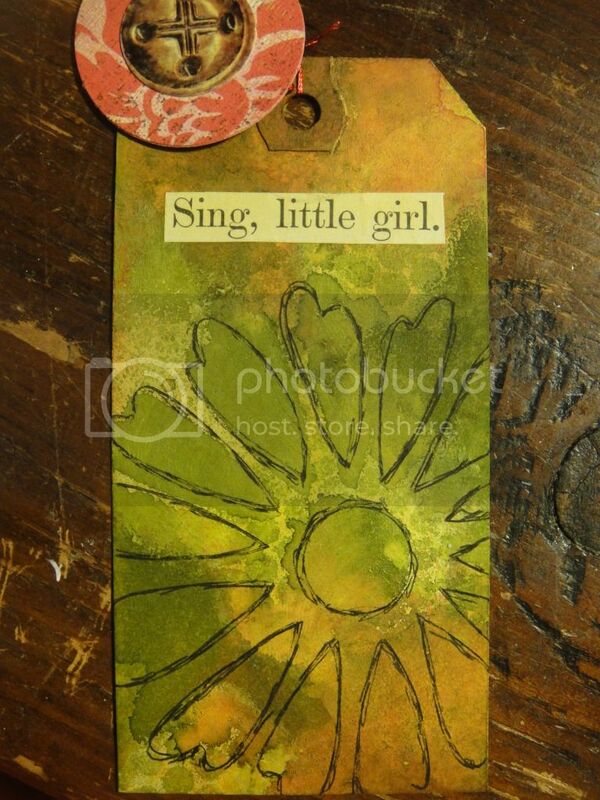 Then I have the following ideas to work with on my page: path, summer, play, yellow, and gift. That gives me a color scheme, a central image, and a theme, and even suggests some personal experience stories that I might pull from to illustrate on my page. 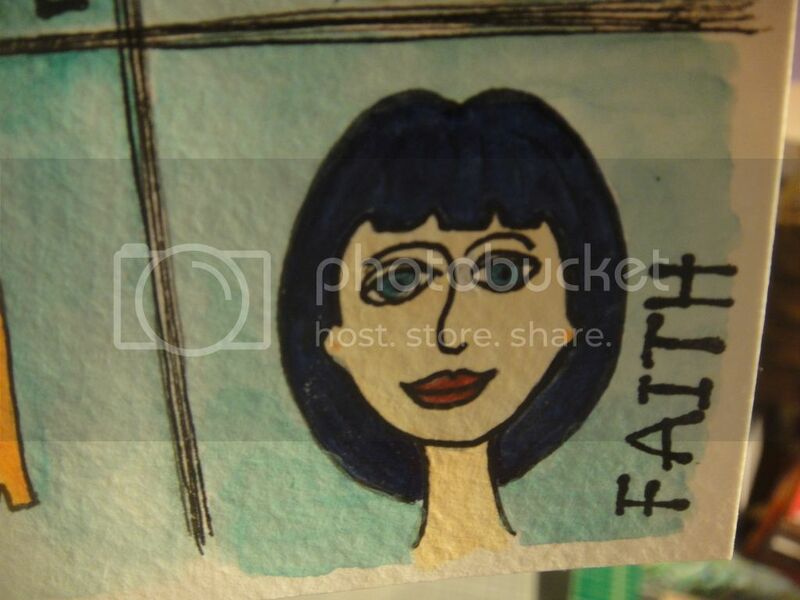 Tammy sent the prompt cards in a painted envelope that is the pefect petite size to affix right into my art journal so that the BINGO cards are available for inspiration at any time. 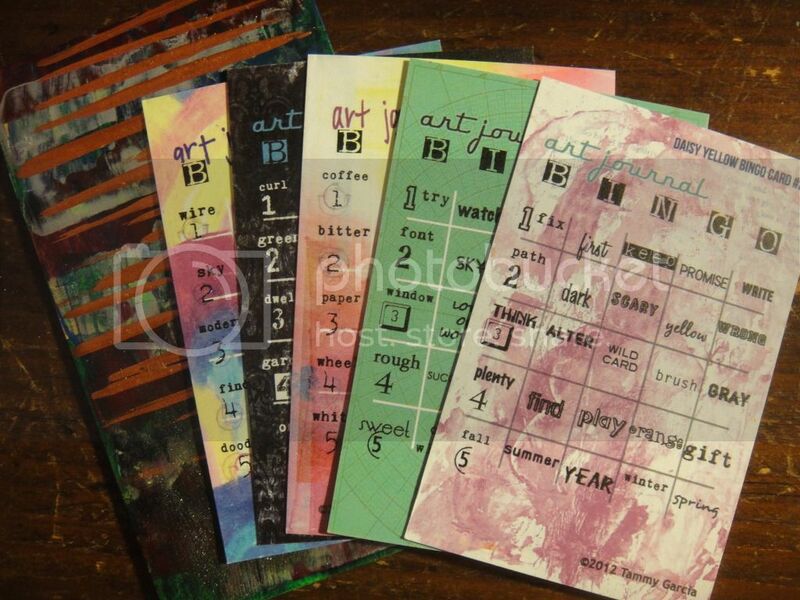 If you would like to purchase art journal BINGO cards for your own use, check out Tammy's blog post about them, and follow her links to buy some for yourself (or a friend!). 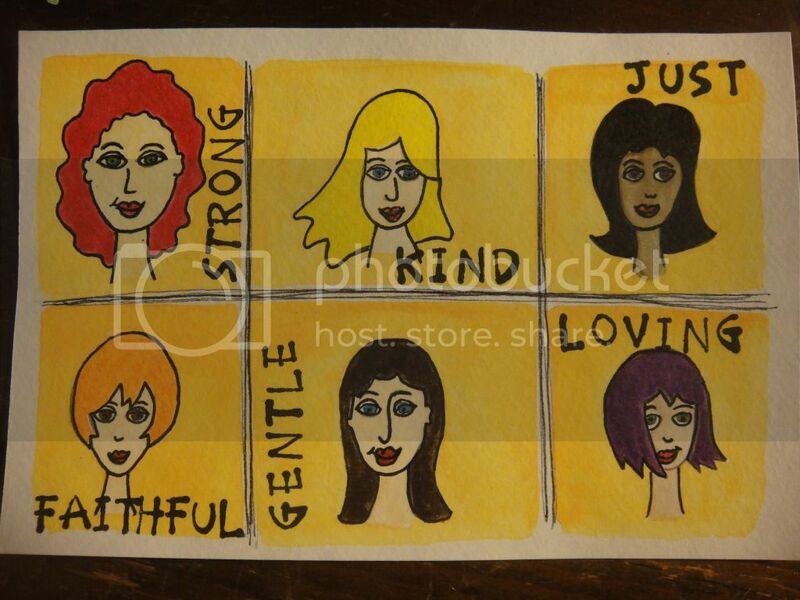 I am involved in a couple different individual postcard swaps right now, and decided to create some cards with the girls I've been drawing lately in my sketchbook. 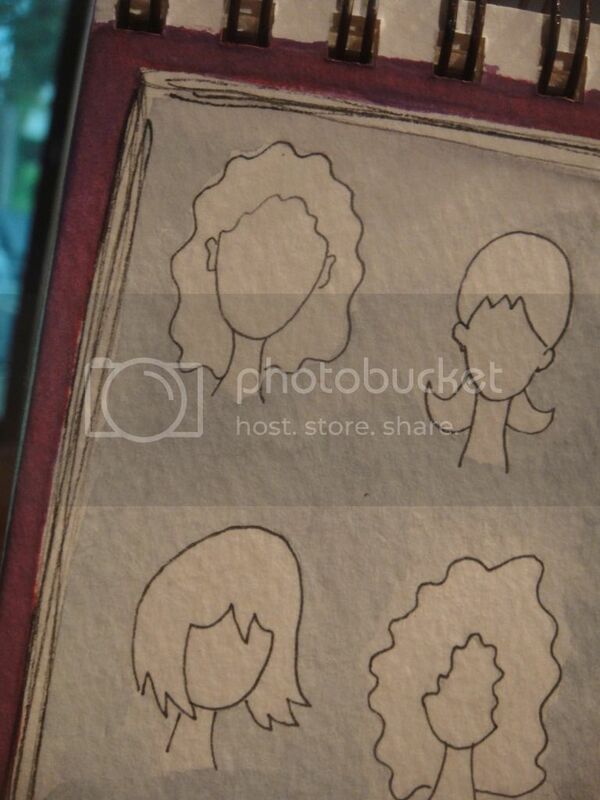 For the first postcard, I used the same faces and hairstyles as the girls I showed in my previous post. 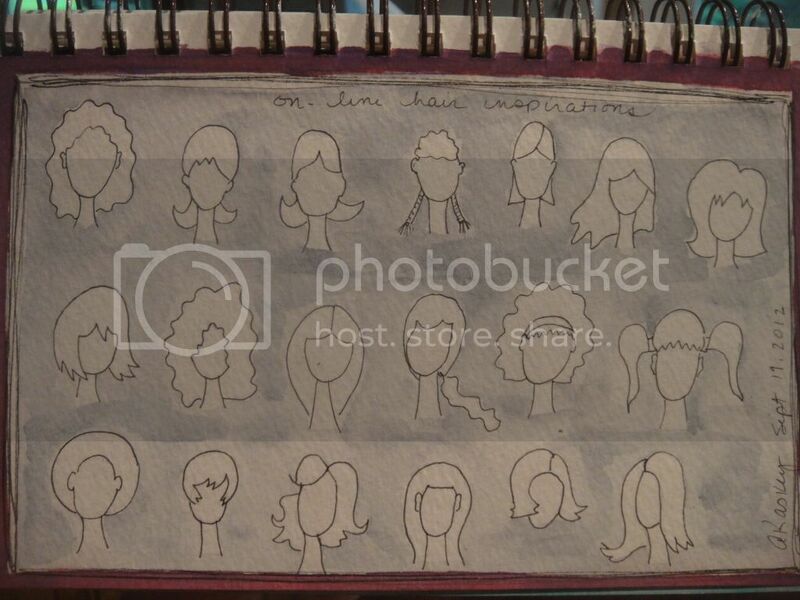 Before I created the second postcard, I spent some time online investigating some other possible hairstyles, which I recorded in my sketchbook. I am having fun creating all these little characters, and imagine I have a few more pieces in me to add to my See the Good in Everyone series. 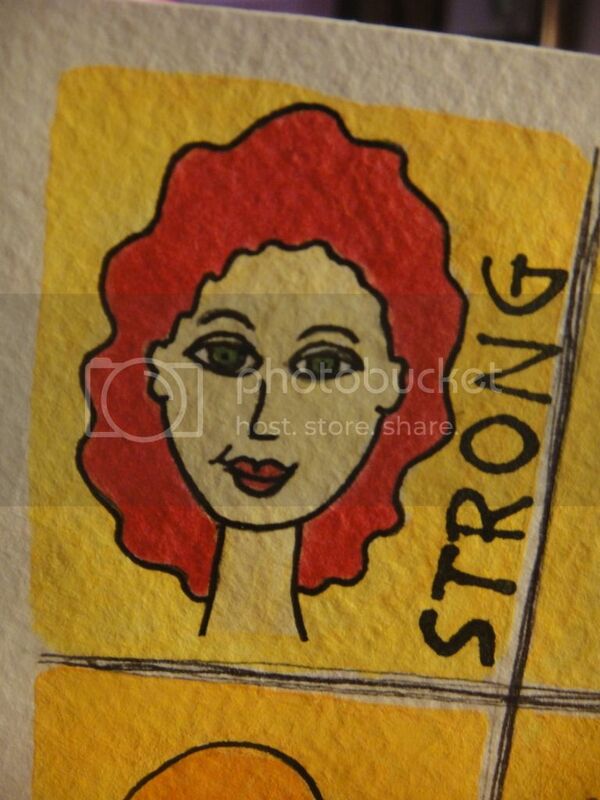 I have long admired the work of Alisa Burke, who often shares "peeks" into her sketchbook on her blog. 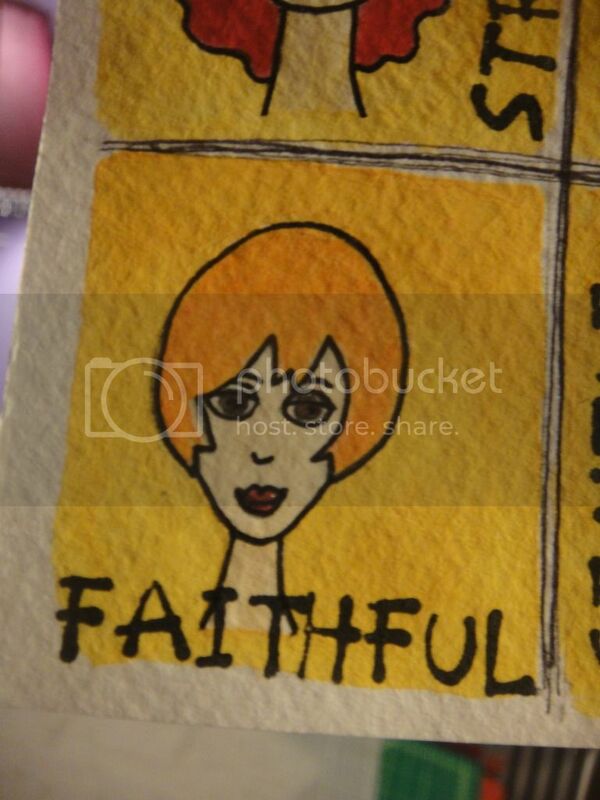 Truth be told, I have often been a little overwhelmed by her seemingly unattainable talent! 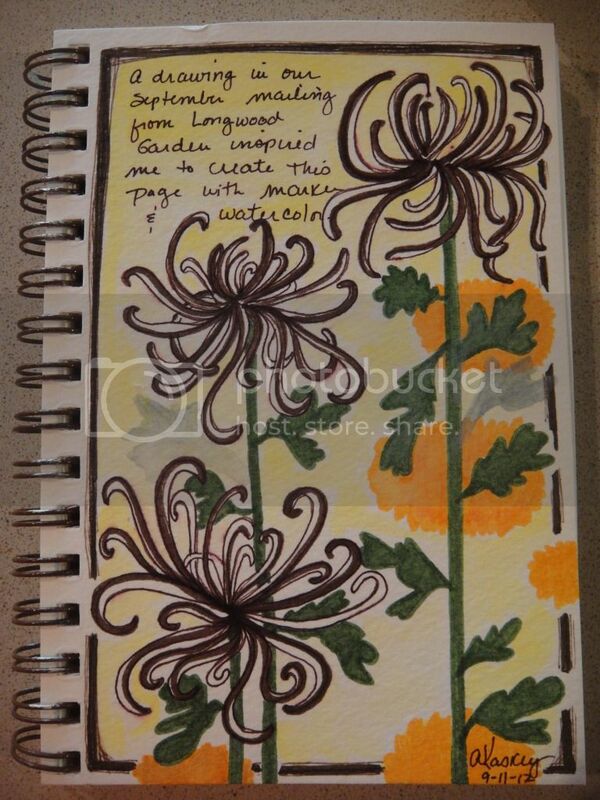 I used watercolor and marker to re-create a page I saw in a newsletter from a local public garden. 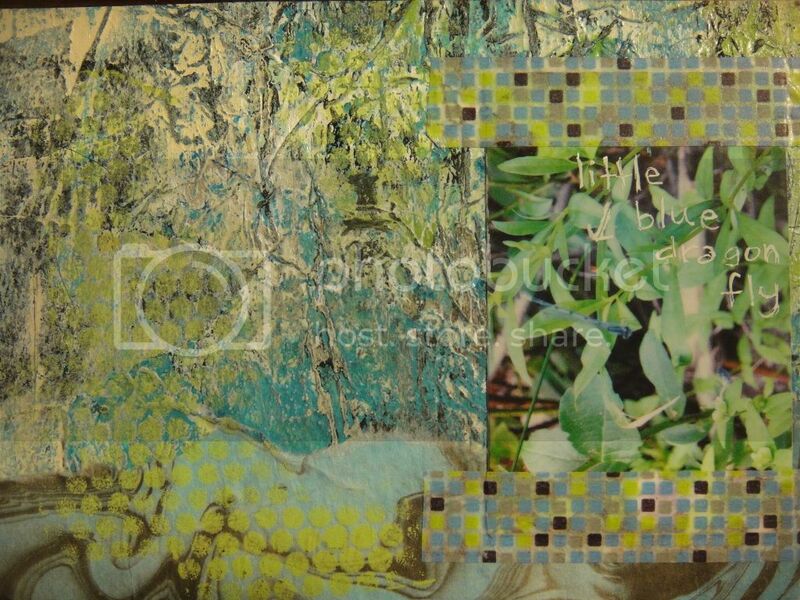 Recently, she offered a free mini-course called "Finding Your Muse." After watching it, I was as impressed as ever by her work, but somehow it seems more accessible now that I had watched her in the process of creating her sketchbook pages from start to finish. 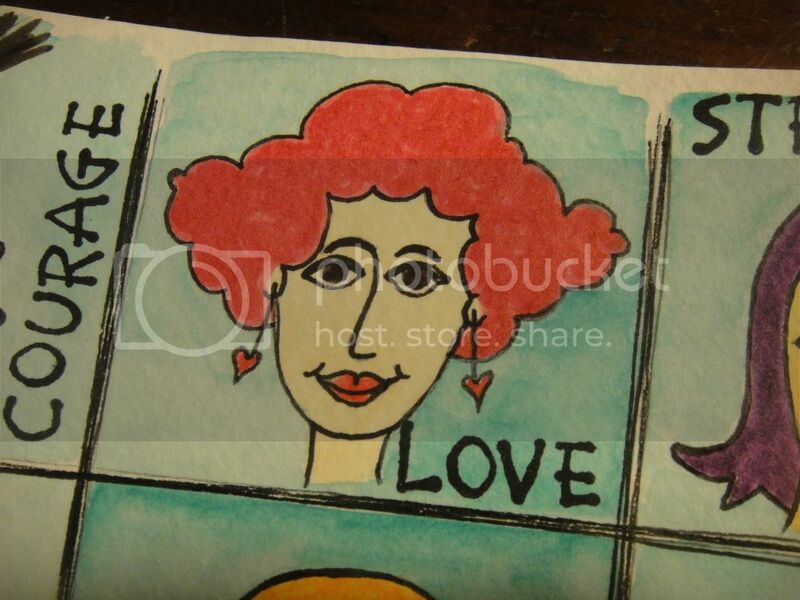 Prompted by that video, and an offer of $10 off her classes, I signed up for her Sketchbook Delight eCourse. I have a rather bad track record with online classes: I have signed up for a couple that I've never made my way entirely through. (Thank goodness for the "unlimited access" feature of so many classes!) Alisa's class, though, has captured my imagination like none other, and I have no doubt that I will make my way straight through her lessons, which are chock-full of videos, still images, and invitational "homework assignments." 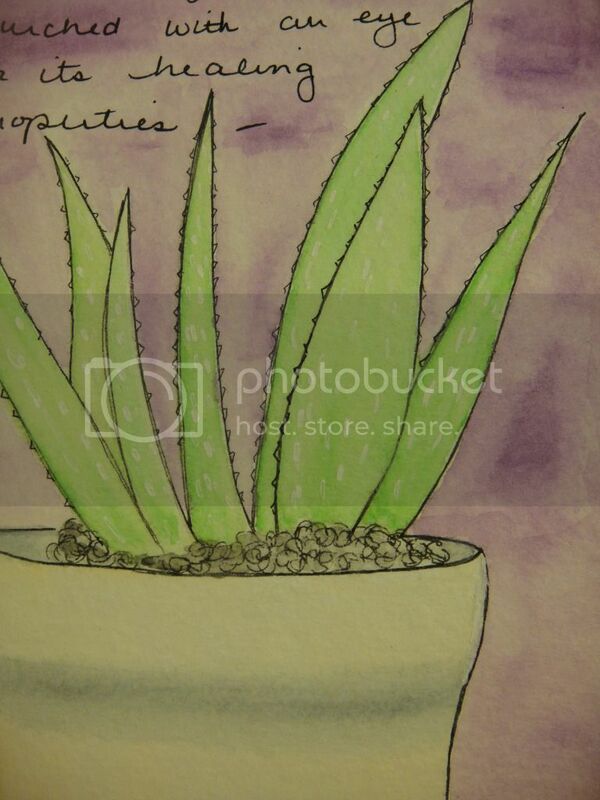 I used watercolor to draw a recently-purchased aloe plant that sits on my kitchen counter. Her main emphasis is on turning off the computer, closing the magazines, and looking to our own lives for drawing inspiration. Meanwhile, she has us trying out our supplies to decide what pencils, pens, and paints work best for our personal style. She has us exploring patterns and shapes in the objects around us. 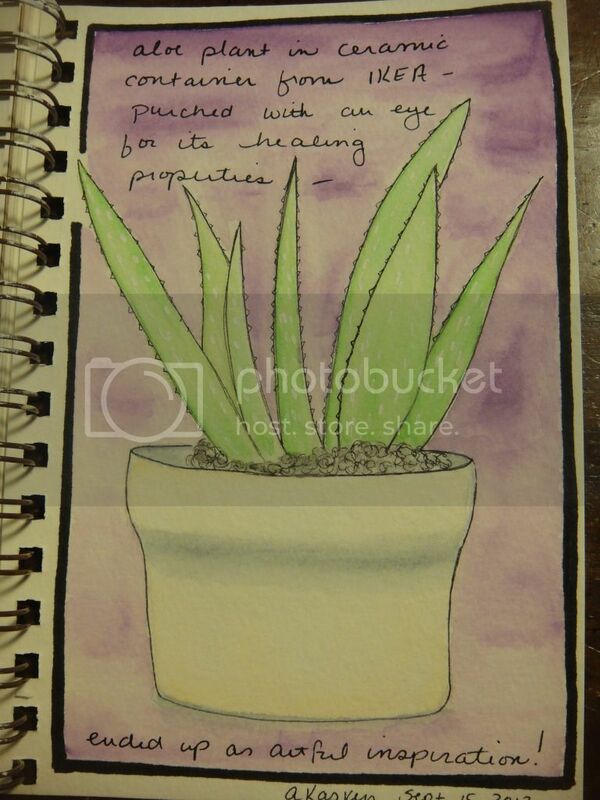 And she offers great advice for making a sketchbook page feel "finished," such as the frames she often places around the edges of her pages and the way she fills in open spaces with watercolor backgrounds--two pratices that I've already adopted in my own sketchbook. 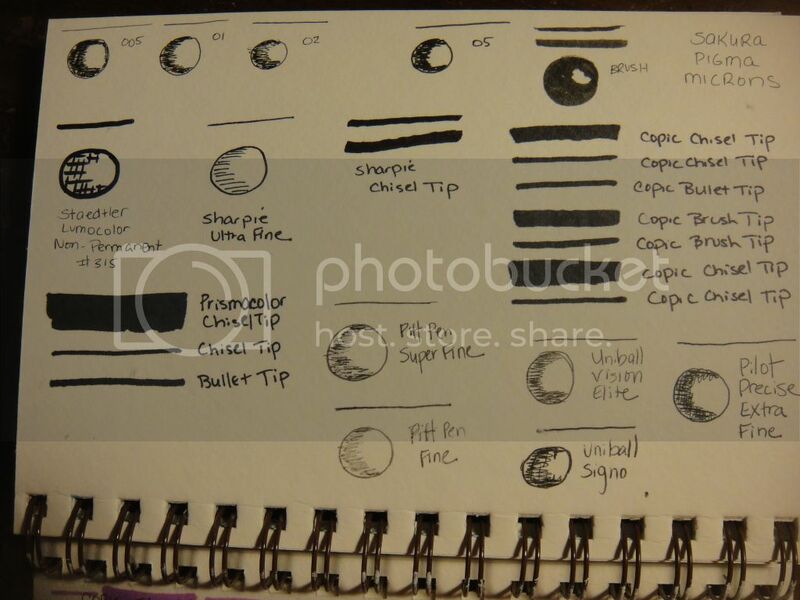 I created a reference page to explore some of my pen and marker options for drawing in my sketchbook. I've actually made quite a bit of use of this page as I've worked on other pages in my book. I find myself looking forward to grabbing my sketchbook and working on a page each day with an enthusiasm I haven't really felt about any other creative pursuit. There is such a wonderful simplicity to working with a book, a pencil, a few black pens, a waterbrush, and a set of watercolor paints. Maybe it sounds like a large list of supplies, but in reality, it is all remarkably compact and mobile. 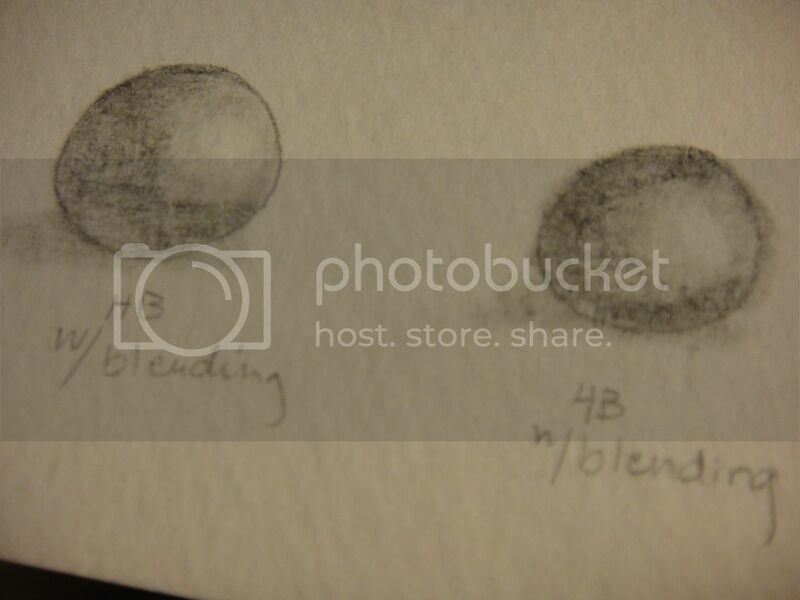 Finally, I created a reference page for my pencils, exploring their varying hardnesses and shading capabilities. 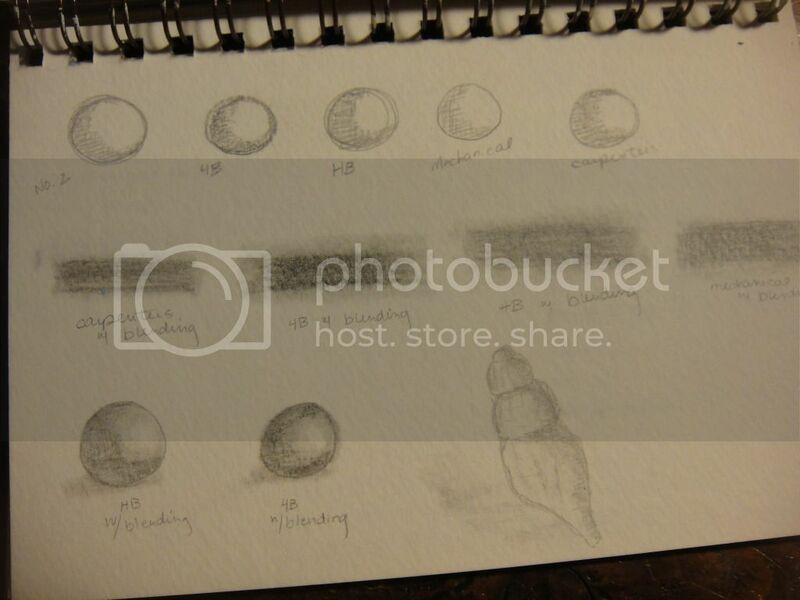 They represent the first step in each of my sketchbook pages. I love how the shading on these little balls turned out! My daughter is mesmerized by Alisa's videos, as well as my own sketchbook efforts. She sits with me and watches as I draw and paint, sometimes re-creating elements of what she sees me doing on her own drawing paper. I never would have dreamed it possible (since drawing has long seemed completely out of my reach), but a daily sketchbook practice feels like something I could definitely adopt as part of my creative life! I have returned to working in my sketchbook daily, which I am loving! 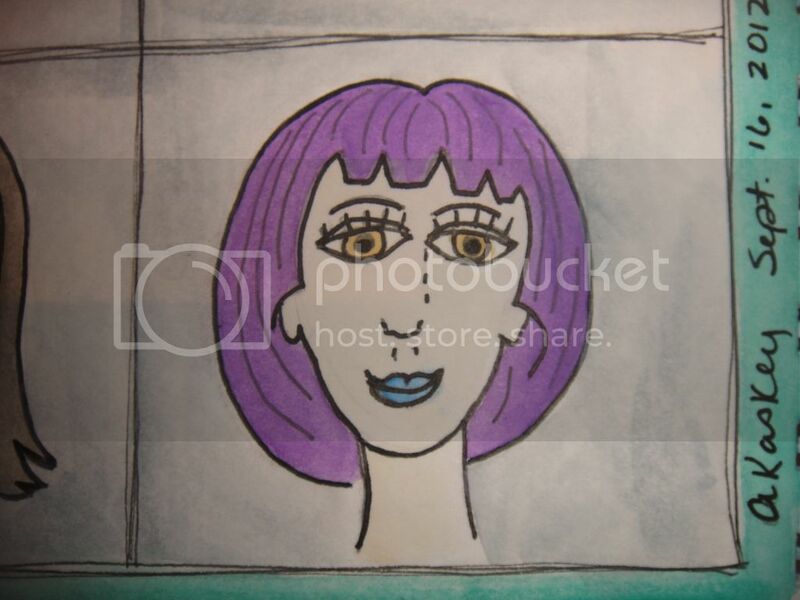 In the midst of my practice sketching, I received my September e-Newsletter from artist Violette Clark, called Violette's Creative Juice News. 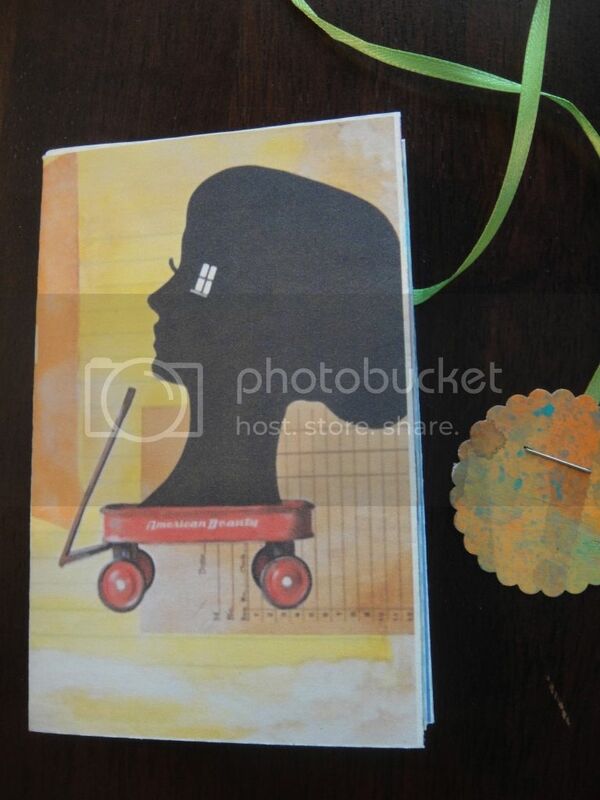 In it, she shared a link to a free tutorial showing how she draws her signature faces, like the women featured in her book, Journal Bliss. 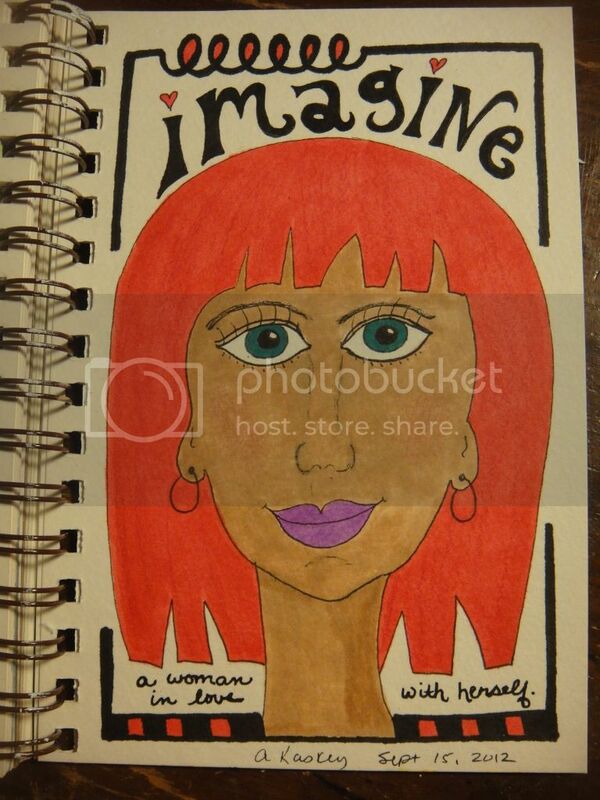 I love the book title, Imagine a Woman in Love with Herself, by Patricia Lynn Reilly, so I incorporated these words into my picture. Perfect? Absolutely not! 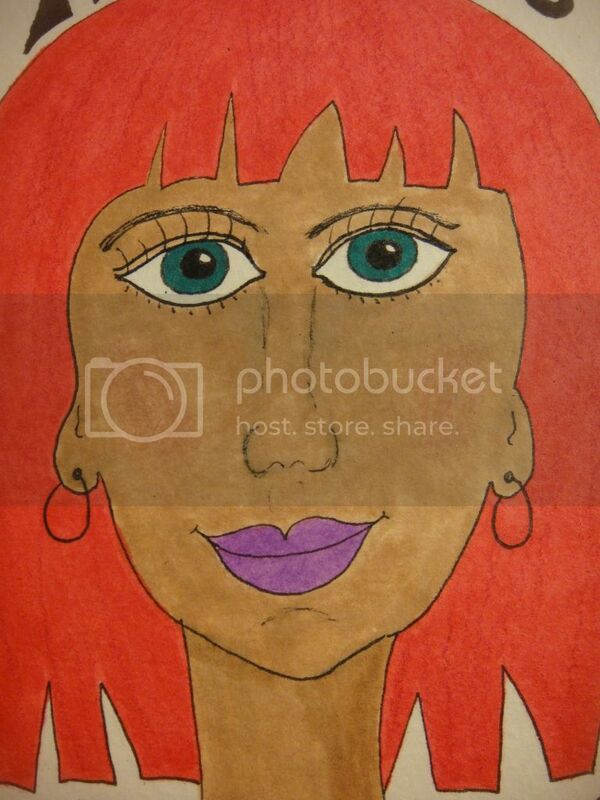 But I love the bold colors of her hair, eyes, and lips, and overall I thought she came out pretty well considering my total lack of experience with drawing people. I thought Violette's video tutorial made the whole process fun and do-able. I went on to practice some other girls from her book, Journal Bliss. 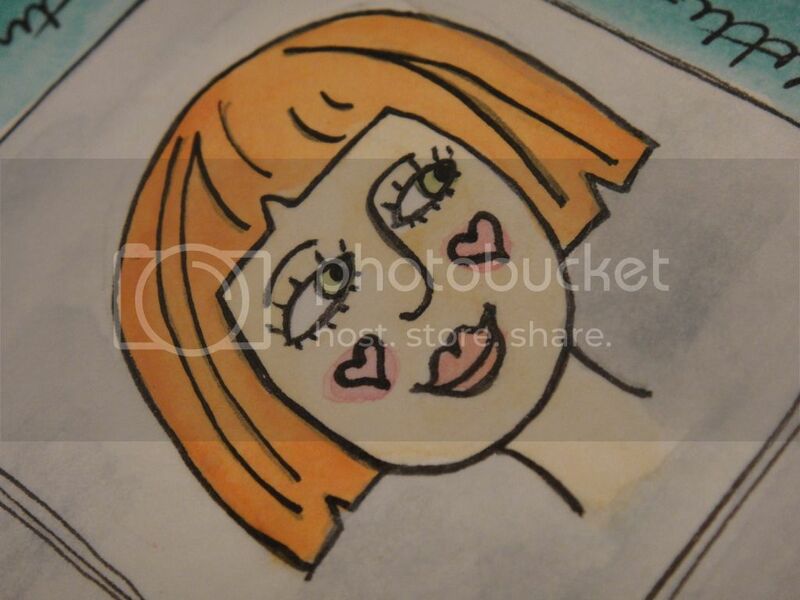 My four-year-old sat leaning against me as I drew and used my watercolors (which was a feat in itself, as she wriggled and squirmed! 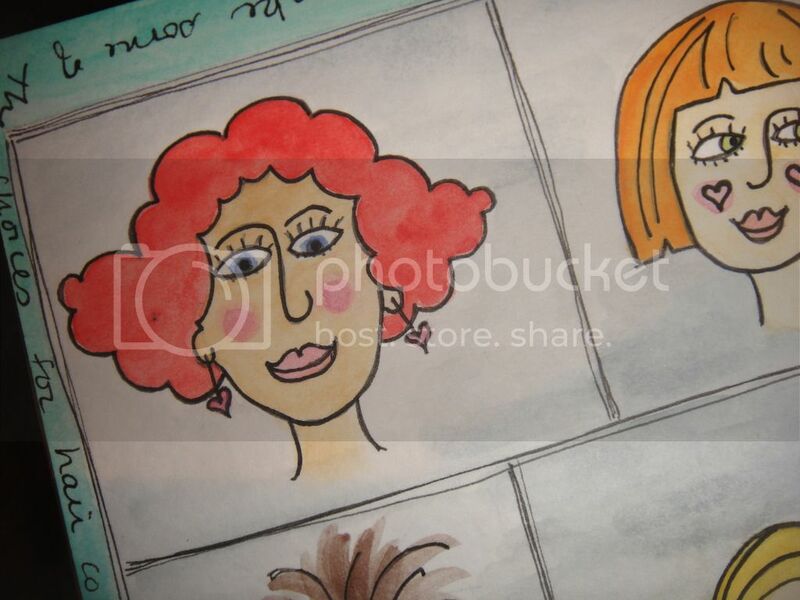 ), helping me make choices for hair and eye color, as well as skin tone. 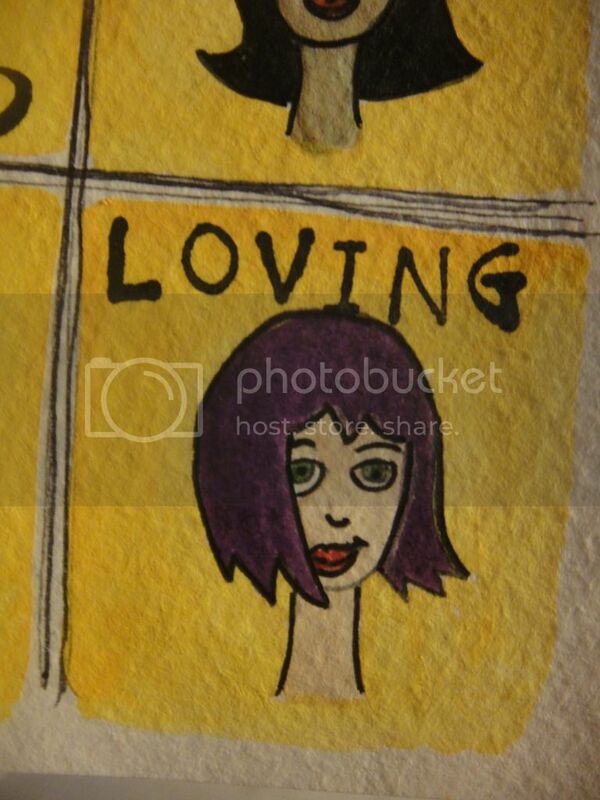 The one with the purple hair, below, is my vampire girl: pale skin, cold blue lips. A little creepy, but I like her hair quite well. My daughter thought this one, below, looked angry about something. 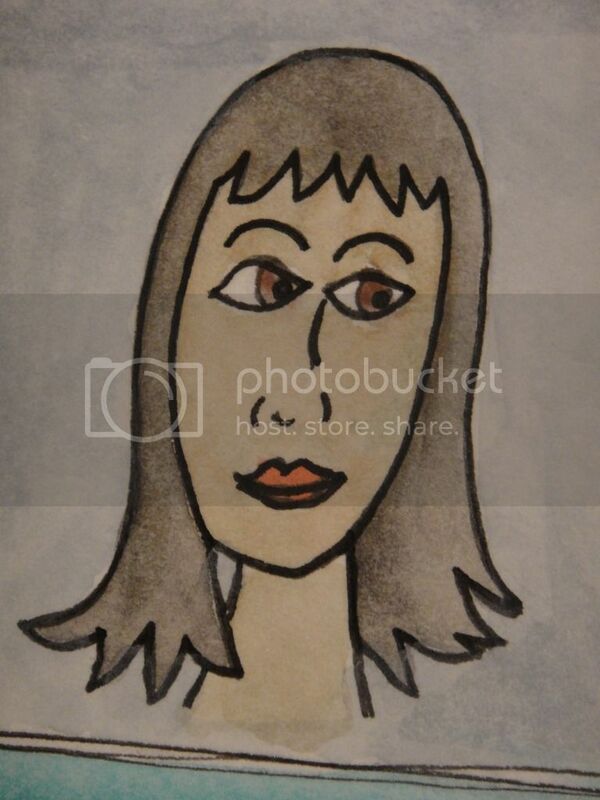 I think she looks a little shy or distressed, like she's biting her lower lip. For each portrait, I drew first in pencil, then outlined in black Micron ink. I went back and erased my pencil lines, and then added watercolor with my watercolor brush. 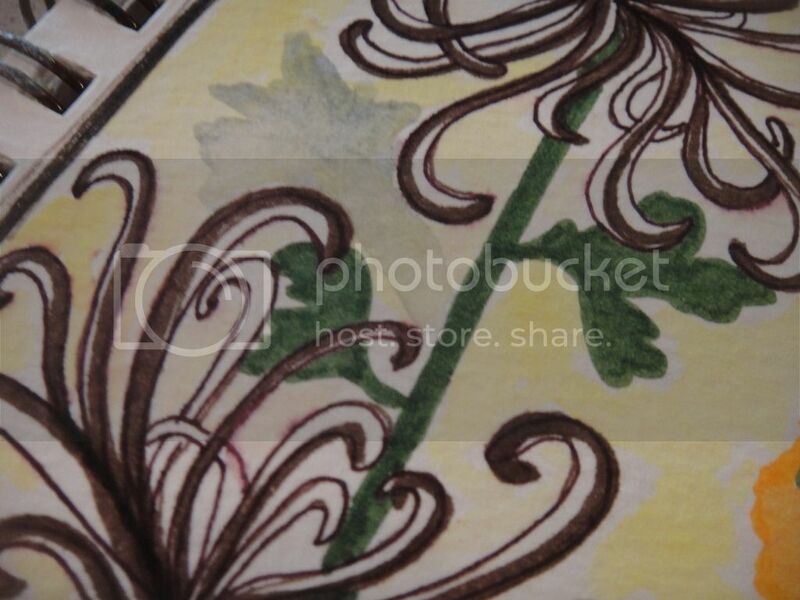 I then went back over the lines in black Micron pen again to brighten them up from the paint. 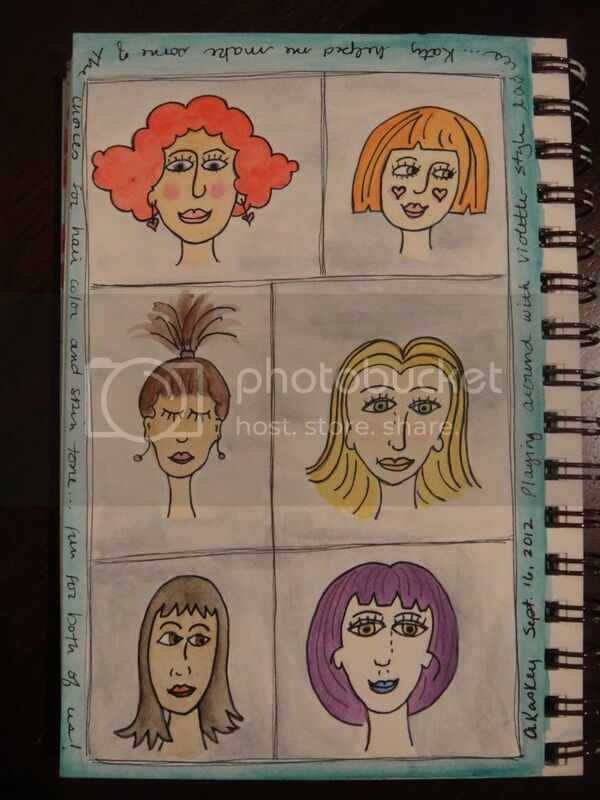 I also used watercolor to fill in the portrait squares, as well as the frame around them, taking a cue from Alisa Burke who likes to fill in all the spaces on her sketchbook pages. 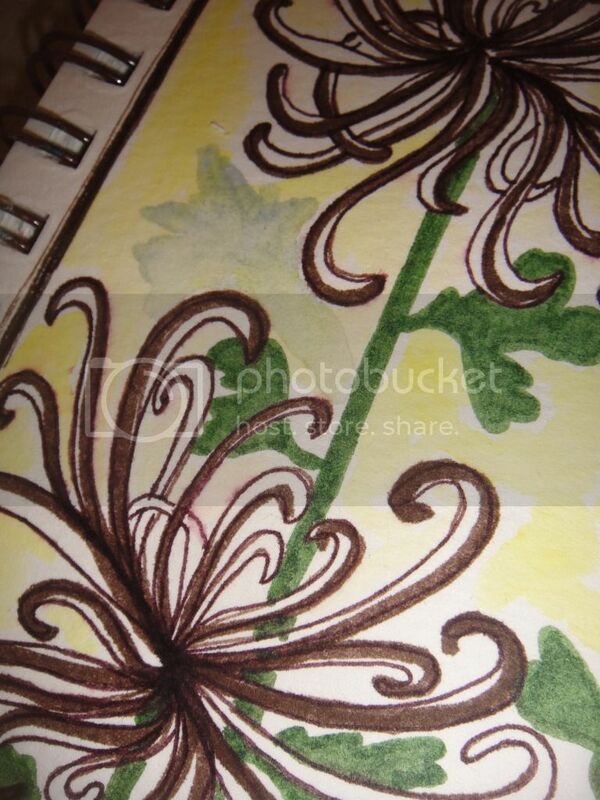 I am in the midst of taking her online course, Sketchbook Delight. But that is news for another day's blog post! I have a lot of catching up to do in order to share with you all of the amazing art I have received in the mail over the past couple of months. 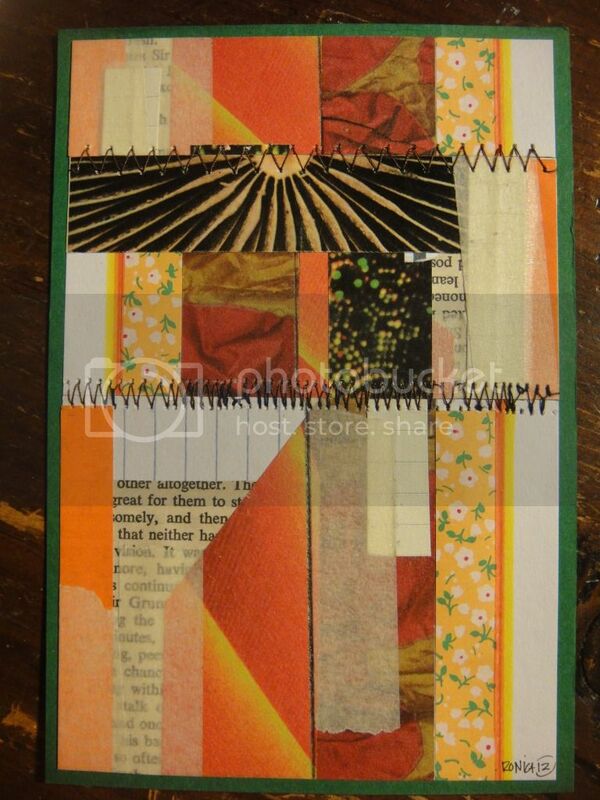 Here is another gorgeous postcard from Karenann, who collages two cards, then sews them together, tucking a note or tag of some sort in between. Her lucky recipient must carefully cut the stitches to get to the treat inside! 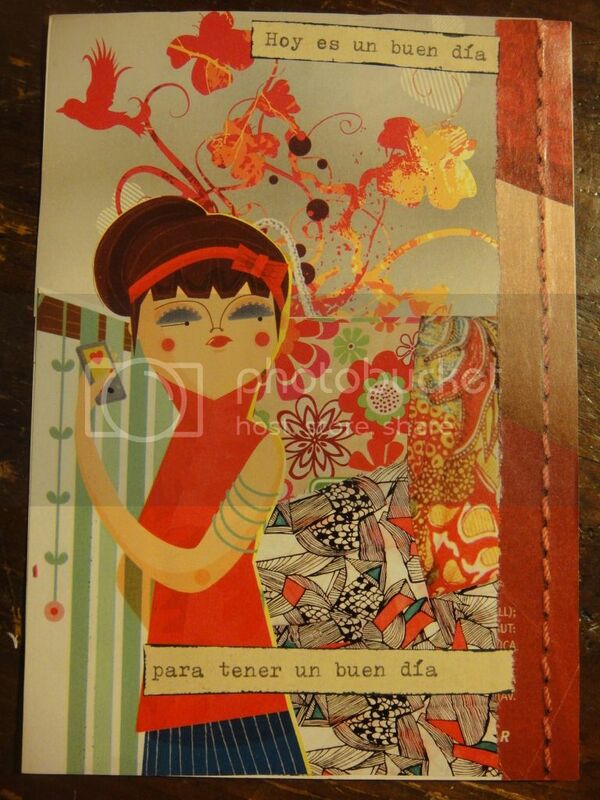 I love the saying, "Hoy es un buen dia para tener un buen dia." (Today is a good day to have a good day.) I say it to my daughters all the time now! 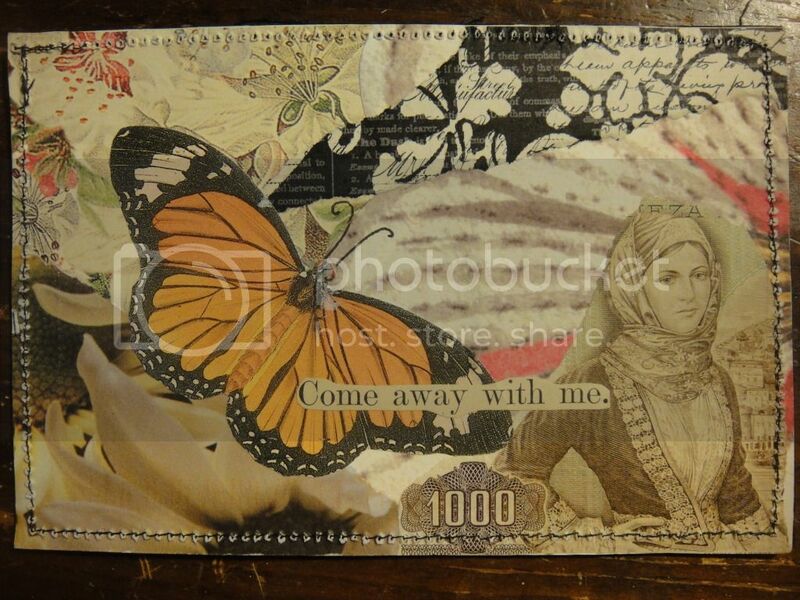 She prepared her backgrounds ahead of time, and then added Pogo printed photos that she took while on vacation. Brilliant! 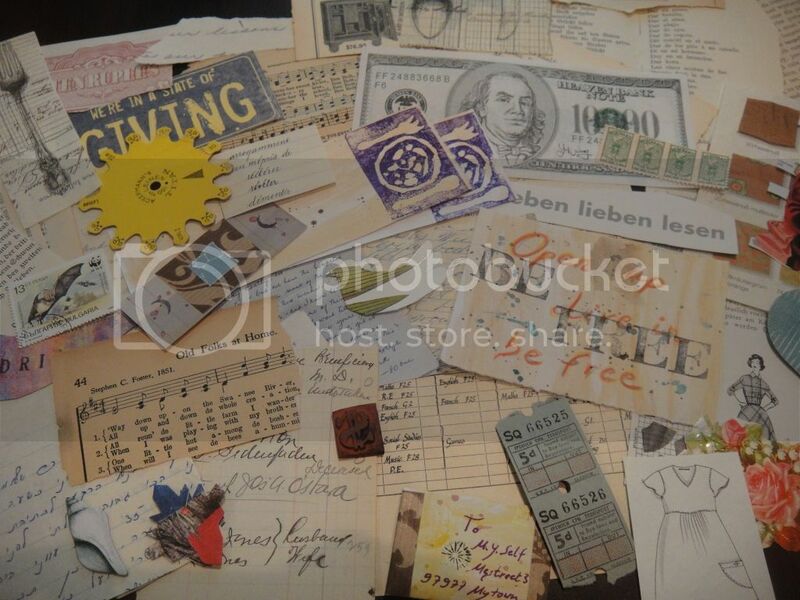 And finally, for today at least, I don't think I ever shared the full haul I received from a private paper swap with F.M., or LaWendula, of Wee Hours. 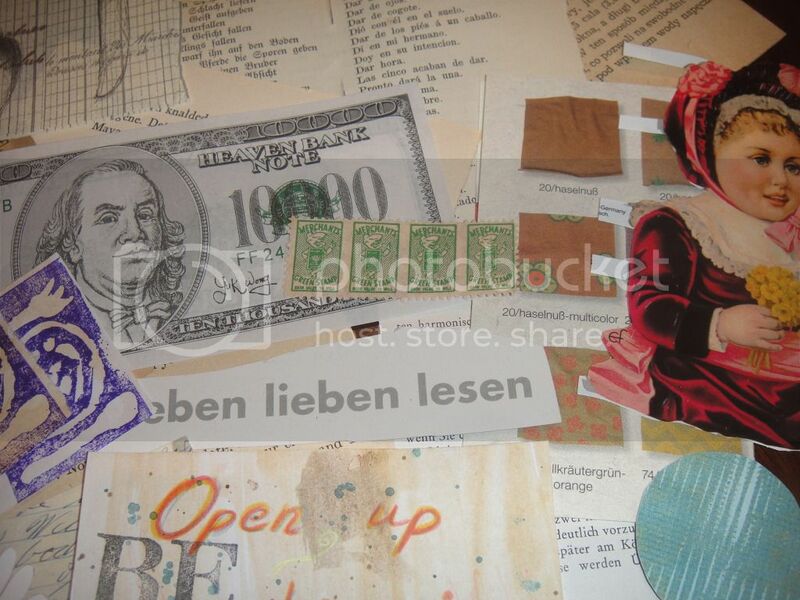 These are the papers that went into some of the collages I made recently for my other swap partners. 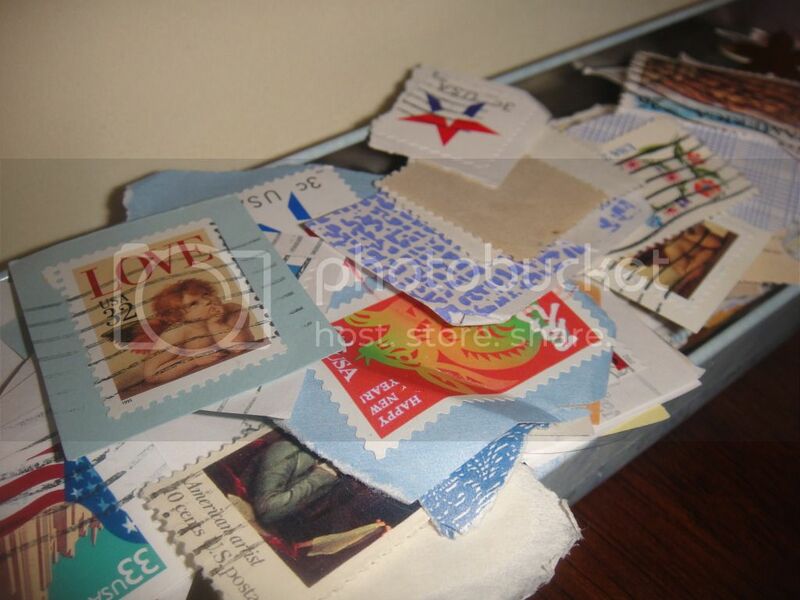 There is even more to share, which I will get to in the coming weeks, so stay tuned, and keep sending all of that creativity and love through our postal system!